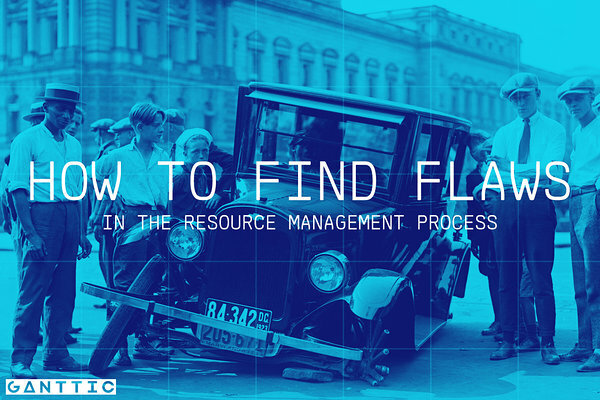 If you are looking to discover how to find flaws in the resource management process it might be that you have noticed that the project progress isn’t what it should be. My other guess is that you must solve too many resource conflicts. And all of it has left you with a feeling that what you are doing is far from effective resource management and there must be something wrong with either the process or the resource management techniques that you are using. To be honest, it might be one, or the other. There’s also a great chance that you are trying to fix something that isn’t broken. However, still, if the project progress is insufficient or if there are too many conflicts that resource management should prevent, there must be something wrong. When I first went back to the university to get my Masters degree, I had successfully kept track of my daily assignments using a mix of post-it notes and iPhone Reminders. I had my own little resource management process. On Friday of each week I wrote down everything I wanted to achieve during the next week, and then divide it between post-it notes. I had a post-it note for each day. If I didn’t complete all the tasks for the day, I didn’t cross it off or through the paper away. That task became the first task for the next day. Whenever I agreed to go to an event or accepted a deadline, I made a reminder. As I faced two years of constantly being on the go to get things done, I quickly understood that my beloved post-it notes and reminders just won’t do. While I was away from the office I could never remember what I had planned and if I had enough time to squeeze in another task for the day. I couldn’t manage all the deadlines, events, and assignments using reminders. I needed an overview of everything that’s going on. My resource management process and the resource management tools I was using were screaming for an update. I had to let go of the satisfaction of crossing something off from a post-it note and crumbling it up when all the tasks were done. I analyzed how I had planned my time, and it was clear that to keep track of everything, I needed everything to be in one place. My work assignments, school stuff, and my personal life. It had to be easily accessible and I wanted to be able to edit the schedule from every device I have. My first instinct was to download a calendar app called Planner Pro. It had good reviews and I felt like maybe somehow it’ll do half the work for me. Long story short - it didn’t and I didn’t really need it. I figured the syncing abilities between my devices and Google Calendar sync is what’ll end up helping me instead. First, I synced my Google Calendar with Ganttic. We are using it for high-level resource planning, so everyone has to book their time with projects they are working on and the holidays. Not daily assignments but the end-goals of those daily assignments. I created a separate calendar for that. Whenever I take on a new project, I assess how much time completing it should take based on experience, and then I just book it using drag and drop. I used recurring tasks to book the time I’ll be at the university. Since some parts of my resource management process were actually solid, I didn't reinvent all of it. I still plan my daily tasks on a Friday, and if some changes come up on a Monday, I reschedule. I have calendars with different colors displayed at once to get the full picture. I use time-slotting instead of just writing things down as a to-do list to be more efficient with my time. When fixing your own little time management process, it can be quite easy to find the flaws. However, if it’s the resource management process of a whole organization, things can get a lot more complex. One thing I have come across while chatting with our customers is that more often than not, it isn’t the resource management process per se that’s broken. So, to get to the bottom of what’s wrong, let’s exclude factors that have nothing to do with your resource management process but do have an effect on project progress and the number of resource conflicts you have to deal with. Bottlenecks: A project is taken on. The sales team has agreed on a date when the project should be completed. While scheduling it, you see that there are obvious resource conflicts. You’ll try to do your best to move the date forward on the timeline. If you are lucky, the project will be postponed for a week or two. It won’t solve all the conflicts but eases some. Where it still gets tight, you schedule concurrent tasks and hope that somehow it’s going to work out. Since it has happened before, you are almost certain that it won’t work out. The projects will be behind on schedule. New projects will be taken on that will be doomed from the moment they’ll be added to the resource management system since the tasks that haven’t been finished will accumulate. There are too many concurrent tasks, the resources are overwhelmed, and it seems like nothing is getting done. No priorities: A resource conflict appears. Two managers have booked the same piece of equipment. Surprise-surprise, it cannot be at two places at the same time. There isn’t another tool with the same capabilities. Now, if there are project priorities, the project portfolio manager can easily decide who’ll get the equipment first, and who’s going to figure something else out. If there aren’t any priorities, it’s a no-mans land. There will be email threads and phone calls. Frustration with the process and with the team. Wrong tools: As it was with me and my post-it notes, sometimes, the tools you are using are to blame. The most accessible project management tools - the spreadsheets - are often what create the most problems. Since spreadsheets are basically a free resource management tool, and probably the most customizable one, it can be difficult to opt for something new. You need to be a master at Excel or find a free resource planning template to get things going in the first place. If you do get things going, you’ll soon find out that the editing process of spreadsheets is not easy nor is it fast. And it’s almost impossible for multiple users to schedule resource at the same time. That kind of problems waste time and create unnecessary resource conflicts. Once you have excluded the other factors and are sure that the process is the problem, ask yourself one simple question. Where do you think there are flaws? It’s kind of like going to the doctor. You know the best what’s going on. You know what causes you the most stress, you know where to projects get stuck, and you also know how things are done in your organization. Even if you can only name the outcomes that bother you, it’s a start. You can backcast it to the origin of the problem by taking steps back to where it starts going wrong. A thing you can do, to help you figure out where the flaws are, is to write down all the steps in the process. How we do resource management, can be so a process that's so automated in our heads that sometimes we don’t even notice where we are going wrong. However, once the steps you take - from taking on a new project, to forecasting, and analyzing the progress at the end - are in front of you, it’s easier to pinpoint a problem. Think about every stakeholder, how people collaborate, how information is exchanged, how transparent and understandable the process is, are problems prevented or dealt with. While improving internal communication is a subject that cannot be opened with a single blog post, getting a complete overview can be. A good overview is one of the answers to the question ‘Why is resource management important?’ Effective resource management strategies will give you an overview of everyone and everything. And an overview gives you the control. Views: First things first, if you are planning hundreds of resources, you can’t do it with a single calendar view. You need to divide the general resource plan into manageable bits. In Ganttic, those bits are called views. For example, when scheduling a project for a specific department, it can be bothersome to find the resources of that department from the general resource pool. The problem can be fixed with filtering the resources out, selecting the time period that suits the time-interval used for planning in the said department and saving it as a new view for easy access. Views like that can be created with various characteristics, and all the views are displayed in the list of views. Learn more about planning resources for projects using views. Sorting by utilization: An added bonus to the views is sorting by utilization. Resources won’t get overbooked or overlooked. Problems can be solved before they happen. Learn more about sorting and other view settings. Continuous reporting and graphs: I don’t think there are many people out there that actually like the process of reporting. But I do know many people who think reporting is a resource management necessity. You can’t have one without the other. That’s why, in Ganttic, we have made it a bit easier for you. You can send reports out automatically. You can also keep an eye on the utilization, busy time, etc continuously in a visually pleasing way using graphs. Use those things to your advantage. Good old meetings: As annoying as it is, looking people in the eye and talking to them is still the best way to get things done. The Ganttic guy from Innopolis Engineering says that: ‘Once a week we meet with each department’s leading engineers. During that meeting, we analyze if there’s a need for reallocating resources. Our other meeting is with project managers. The project managers give an overview of their week and tell 'the Ganttic guy' if they need any additional resources or not. Once every two weeks, we have a board meeting. This meeting concentrates on sales activities and analyzing resource capacity.’ Learn how to master holding a productive meeting.